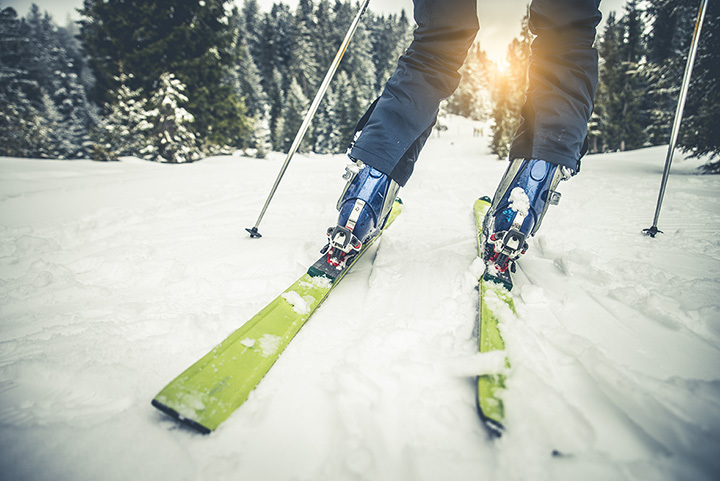 When it starts to snow and you’re looking to get a workout in the great outdoors, Maryland’s cross-country skiing options will surely give you just that. Many of these trails, scattered across the state, offer scenic views and ideal terrain for a favorite winter sport. Here are our 10 favorite cross-country skiing trails in Maryland. With 520 acres of fields you can enjoy 9.5 miles of maintained Nordic ski trails in addition to groomed trails. If you want to cross country ski, Blackbone Ski Farm is an excellent place to do so and you can warm up by the fire with hot chocolate when you are done. For a moderate and much longer trail, head to the C&O Canal Towpath Trail Section #3. This portion of the trail is a 41.4-mile area that requires moderate skills and features the stunning views of a river. Keep in mind that the total trail is 184.5 miles so you will never run out of new vistas or areas to explore if you are up for an adventure. The Patuxent Branch Trail allows you to cross-country ski for 20 miles along the old railroad line. Start your journey at Savage Park and keep an eye out for abundant birds and wildlife along the way. Ski along the park roads that are closed to vehicle traffic. This is a mountain so keep in mind that the trails are typically narrow and slightly rocky so this is a better spot to go for more experienced cross-country skiers. However, with such a huge national park, you are bound to find some absolutely stunning scenery and peace and quiet. If you're looking for an easy trail that you can try as a beginner or somewhere to take the kids, Lake Artemesia is a sure bet. It is only 2.4 miles long and it has a river that makes for a beautiful scenery. This trail is famous for bird watching, so you may want to keep a pair of binoculars around your neck. You can head to New Germany State Park to cross-country ski through Western Maryland Forest. Additionally, there are 11 cabins that you can rent to make a weekend or a weeklong vacation out of it. For a more upscale experience, visit Savage River Lodge. If you want to learn how to cross-country ski and do not have your own equipment this is an excellent place to start because they have the equipment rentals and they even have certified instructors. Additionally, there are 18 luxury cabins that you can stay in to make it a nice vacation. If you want to remain near the DC area, you can visit Watkins Regional Park Trail in Upper Marlboro. The trail is only 1.8 miles-long so it makes for a quick jaunt and it is incredibly easy. Children will appreciate this and if you take them to the park or Old Maryland Farm in the summer, this trail will be familiar only covered in snow. Maryland’s favorite ski resort, Wisp Resort is a four-season ski resort and conference center. Located in Western Maryland, the amenities are incredibly comfortable, the area is built for families, and the outdoor Nordic Center makes cross country skiing easy and fun. They have other fun activities too like an ice skating rink, snow tubing area, rides, and of course—downhill skiing. In other words, everyone in the family can play, stay, and have a great time. If you live in the DMV area, cross-country skiing in Bethesda is about as easy as you can get. This 14-mile trail does have a fair amount of foot traffic but it is an excellent place for you to cross country ski with the family due to the convenient location and the fact that it's rated as easy. View more Maryland Cross Country Skiing Trails.